Helen’s career spans the arts, music, community development, design and teaching as well as management of a successful regional Australia events management business. Her broad experience combined with her natural enthusiasm, strong work ethic, sense of integrity and commitment to fun, enables her to communicate at many levels with positive and inclusive results. Helen has performed in theatre productions and television series and worked as a dramatic arts teacher, musician in residence at the Royal Children’s Hospital in Brisbane, manager of Ronald Mc Donald House in Sydney and director of Dingo Design in Sydney. As owner of HHO Events (2000 – 2013) she programmed, produced and presented countless events around Australia including the significant Ouyen Raindance involving five hundred women joyously attempting to end the drought. 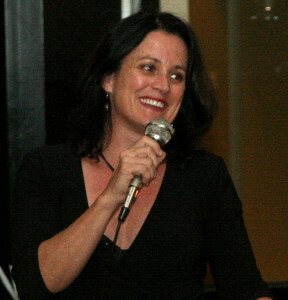 In addition Helen has been festival director/executive director or creative producer of numerous arts events including the Mildura Writers Festival, Mildura Wentworth Arts Festival, Mildura Jazz, Food and Wine Festival, Murray River International Music Festival (Co founder) and in 2013 was the Producer of the Indigenous program for the Centenary of Canberra. In 2009 she was acknowledged as a Victorian Small Business Regional Hero and was recognised nationally as a finalist in the Sydney based, Australian Event Manager of the Year Awards in 2009 and 2011. From her childhood background in regional Victoria, education in Ballarat and Melbourne, to travels around the world and vast experience with performers, media, business and government, Helen brings extensive knowledge, skills and commitment to her work. In addition to regular performances of her own compositions and working on her first novel, Helen is the mother of two talented young people and her passions include singing, reading, writing and composing. Her interests range from working on exciting projects to rowing, yoga, playing cello as well as good friends, good food and travel. Helen currently works with businesses and community coaching in project & event management, delivering strategic planning & capacity building workshops, managing marketing & social media and delivering special projects.